To tell you the truth, I struggled with the idea of doing a post on this issue. The other writers tell me I am the blog owner but when it comes to decisions like this I usually get out voted. 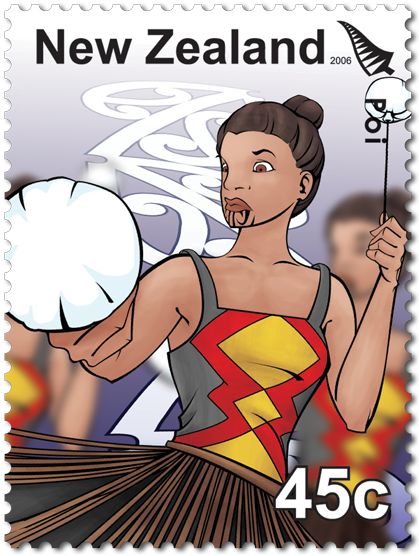 They said this issue is on the NZ Post website, it's on the Stamps NZ website so it should be on ours too. Since I do all the issues with Maori themes, I've got the job. The story goes that certain Maori groups were horrified when they saw these stamps and complained to NZ Post. The issue was rejected just before it was issued. All stock already sent out to postal outlets was recovered and returned for destruction so that should have been the end of the story. But it wasn't as some were sent out to 8 customers before the issue date. In spite of attempts to have these returned, some, as listed below never were. Generally, I like the great job that has been done over the years regarding our postage stamps. I am proud to see them representing New Zealand as they do. But this set? Guys, what were you thinking? I think I could except most of the designs but those faces! I know the intention might have been not to show any particular person and I suppose it could be argued that in this they succeeded. But they look so ugly, the worse being the woman on the $1.35 value. Ok, I've had my little rave, let's get on and review them now. For other posts with Maori themes - New Zealand Maori Index. Traditional māori performing arts - kapa haka - is a growing part of māori culture. Ranging from the haka (war dance) to the more peaceful waiata ā-ringa action songs, using the poi, patu or taiaha, kapa haka affirms māori identity for those immersed in their cultural roots, and those who wish to return and be a part of these historical performances. Kapa haka has always been a strong spiritual and cultural part of māori tradition. Kapa haka is unique as performers sing, dance and coordinate expression and movement into each dance performance. Each action is deliberate and links to the words sung. The strong vocals accompanying the music are unlike those of many cultures. Beautiful harmonies and carefully executed body language combine to produce a clear and vibrant performance. See our post - 2011 Kapa Haka. 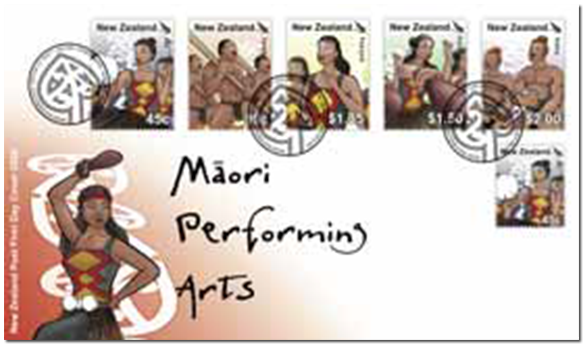 There are five great subjects here showing aspects used in a Maori cultural performance. The poi, if used by an experienced performer, is manipulated and twirled to the music and song of many performances. It is believed the poi was originally used as a means of training warriors to strengthen their wrists. During modern performances, however, it is the women who use the long or short poi, singularly, double or in a quad formation. The long poi is mainly used for spinning movements and actions. The short poi is used for flicking, catching and slapping movements to mark a rhythm of a song. The taiaha is a long staff measuring up to 1.5 metres in length originally used as an offensive weapon to attack an opponent with different strokes to strike the body or head. It has a carved face with an arero (tongue) on the end of it, often incorporating ornate carvings, feathers or paua shell. A work of art as well as a weapon, this staff is used in the kapa haka. The pukana, or widening of the eyes, is part of the performance usually linked to wiri, or shaking of the hands. These expressions are used at various times in the performance to reinforce meaning and add force to the words. 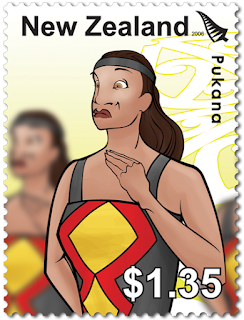 Pukana is described as the innermost expression of wairua (soul) being released. The patu, mere or short club is popular for female performers in kapa haka. The mere symbolises the facing and overcoming of life’s challenges and difficulties. 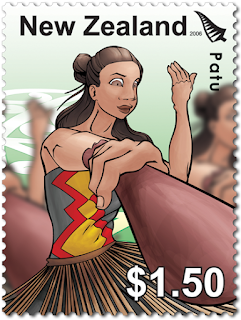 The patu was also a warrior's weapon used in close contact to thrust and strike an opponent. The haka, originally designed to build adrenaline and put fear into enemies before a battle, could have been performed with or without weapons. From post-European times, the haka was performed without weapons, but with well-defined actions. Following the First World War, the haka developed in vibrant and vigorous forms used to express many private or public sentiments. One of the best-known haka is that performed by our national rugby team, the All Blacks, before an international test match. There is more than one version of this haka, each being written with precise choreographed actions especially for the team. Sometime the team will form a semi-circle with the leader at the centre while other times it is performed with the team forming a triangular pattern. All of the team including non-Maori will take part in the haka. Often, an opposing Polynesian team will answer with a haka of their own. First Day Cover - 7 June 2006. 2006 Māori Performing Arts gummed products: 4 x $2.00 single stamp (mint), 9 x first day covers, 6 x sets plate imprint blocks, 3 x complete single stamp sets (mint), 1 x complete single stamp set (used). 2006 Māori Performing Arts self-adhesive products: 1 x 45c dispenser box, 2 x 45c single stamp (mint), 1 x 45c single stamp (used), 11 x stamp booklets. 48 x blank first day covers. Date of issue: 7 June 2006. Number of stamps: Five gummed and one 45c self-adhesive stamp. Denominations and designs: 45c Poi (gummed and self-adhesive), 90c Taiaha, $1.35 Pukana, $1.50 Patu, $2.00 Haka. 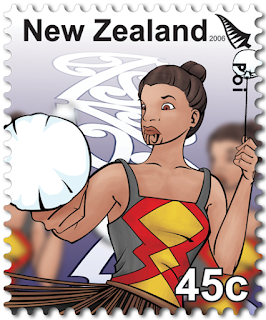 Stamps and first day cover designed by: Abel Vaireka, Brownstone Design Group, Petone, Wellington. Printer and process: Southern Colour Print, New Zealand by offset lithography. Stamp size and format: Gummed: 40mm x 30mm (vertical); Self-adhesive: 30mm x 25mm (vertical). Special blocks: Plate/imprint blocks could be obtained by purchasing at least six stamps from a sheet. Barcode, value block and logo blocks could be obtained by purchasing at least two stamps from a sheet. Barcode blocks were available in both A and B formats. Period of sale: These stamps were intended to be on sale for at least a year but withdrawn from sale prior to the issue date. Such a contrast between this set and the set issued in 2011. No wonder these stamps were rejected by my people.